Today, something happened that has not happened since the Lehman collapse: the 1 Month Gold Forward Offered (GOFO) rate turned negative, from 0.015% to -0.065%, for the first time in nearly 5 years, or technically since just after the Lehman bankruptcy precipitated AIG bailout in November 2011. And if one looks at the 3 Month GOFO, which also turned shockingly negative overnight from 0.05% to -0.03%, one has to go back all the way to the 1999 Washington Agreement on gold, to find the last time that particular GOFO rate was negative. Fast forward to today, when as noted over the past week there has been a massive shortage of precious metals - most notably silver which as of this moment is indefinitely unavailable at the US Mint - as a result of the tumble in the paper price, and following 8 days of sliding and negative 1 month GOFO rates, today the physical metal shortage surged, as can be seen by not only the first negative 6 month GOFO rate since last summer's much publicized gold shortage when China was gobbling up every piece of shiny yellow rock available for sale, but a 1 month GOFO of -0.1850%: the most negative it has been since 2001! Said otherwise, the physical shortage is the worst it has been in over a decade, even as the price of paper gold continues to drop! When are the rates quoted? The means are set at 11 am London time. These are the rates shown on the LBMA website. 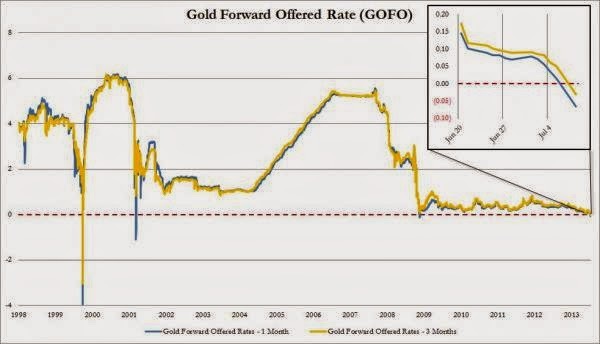 To show derived gold lease rates, the GOFO means are subtracted from the corresponding values of the LIBOR (London Interbank Offered Rates) US dollar means. These rates are also available on the LBMA website. What are some uses for GOFO means in the market? They provide a basis for some finance and loan agreements as well as for the settlement of gold Interest Rate Swaps. Unpleasant similarities with Libor and most other fixed (literally and metaphorically) rates aside, what is known is that under normal market conditions, GOFO is always positive, or in other words gold serves as a money-equivalent collateral for a pseudo-secured loan against paper fiat (USD in this case) hence the low interest rate. Sometimes, however, normality inverts and the rate goes negative and as such serves as a useful indicator of gold market dislocations. Thus, while disagreements exists, one can safely say that what GOFO is, is simply a blended indicator of liquidity, counterparty or collateral (physical availability) stress in the gold market. Since it is next to impossible to isolate just which component is causing the indicated disturbance, it is prudent to be on watch for all three. Indeed, the only other time when both 1M and 3M GOFOs were both negative or almost so (3M touched on 0.05%) was in the aftermath of the AIG bailout following the Lehman collapse in November 2008. Fast forward to today, when all GOFOs, from 1M all the way to 6M just went negative. Ongoing deliverable concerns and/or shortages involving one (JPM) or more Comex gold members. An ongoing bullion bank failure with or without an associated allocated gold bank "run"
The answer for now is unknown. What is known is that something very abnormal is once again afoot at the nexus of the gold fractional reserve lending market.